Not a Lenten Fast. More a Lenten Flop. 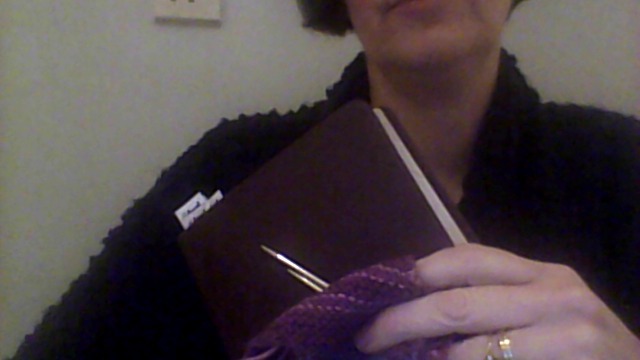 I’ve not been fasting from blogging for Lent. Just a normal blogflop due to life and everything. But here I am again. With some fun pics of my friend Kirby, who made some Resurrection Eggs last week in preparation for the fortnight leading up to Easter. Resurrection eggs are a sort of Jesse Tree for Easter and a creative way to get kids to engage with the wonderful gospel story at the heart of our faith. Kirby used the verses preprepared on this blog. There’s plenty of time to gather yourself an egg box and some plastic eggs. You can use 15 eggs (as Meredith does), a dozen (as I did) or even a simple six. Why not give it a go? Last night we had a great time at Messy Church – the next one in our series on the ‘I am’ sayings of Jesus. This time we were looking at ‘I am the True Vine’ and the craft team decided that they’d like one activity to be making playdough grapes to place on a vine drawn on a paper plate. 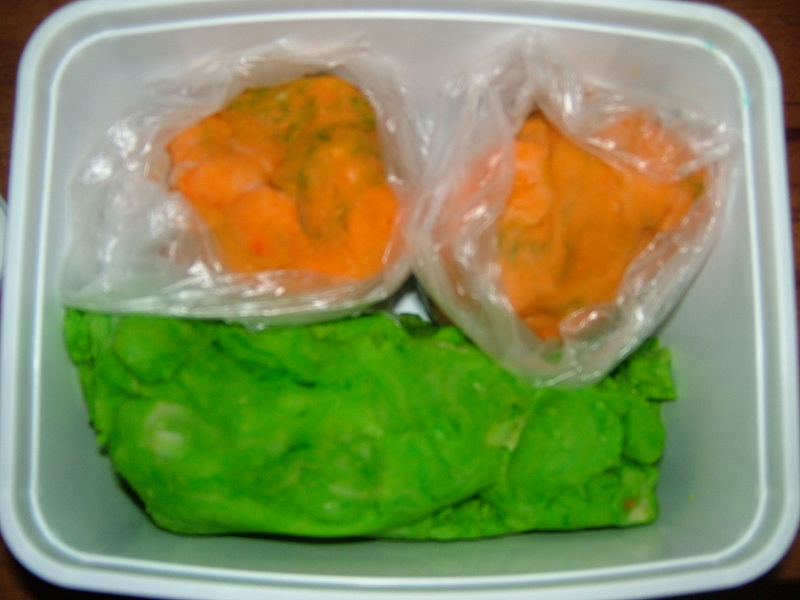 The Vicar then volunteered me to make the playdough, knowing that I had a recipe up my sleeve. Every playgroup leader has a recipe for playdough – that ubiquitous soft dough which mums hate to find in carpets. But many folk I’ve spoken to have found their homemade dough to be too sticky or oily. This recipe always seems to come out well, though, as long as you don’t mind your fingers getting a bit stained with food colouring. It lasts a few weeks if kept in an airtight box in the fridge. All you do is pop all the ingredients together in a pan (preferably non-stick) and heat it up, stirring, until the dough magically forms. You can also do it by heating it in a covered dish in the microwave for 1-2 minutes but it’s so fast on the stove top I use that method. Also, the food colouring can make the inside of a microwave dish look rather interesting. I know these were meant to be grape coloured, but the local shop only sells colouring for pilau rice and Indian sweets, so the colours are a little lurid and approximate. For Messy Church I made a quadruple batch, which was ample. It’s great fun to hold and knead – we gave a couple of handfuls away to some of the teenage tearaways who were lurking in the church yard. One came in especially as he reckoned it would help him to deal with stress. Last year I made a set of Resurrection eggs to talk the kids through the Easter story over 12 days leading up to Easter Sunday. Actually, last year, I started rather late, so it went on post-Easter too. After Easter I discovered that they sell empty plastic eggs in The Works – those shops seem to be nearly everywhere. Much easier than sending off to Baker Ross. So you could pop out this weekend and sort out a set. I was thinking that making a set would be a fun activity for the holidays. We’ll dig out our set from the cellar and maybe tweak the contents a bit. Just to save you clicking through, here are the readings and fillings from the original post. Day 2: 5p pieces for the silver – thankfully I had some in my purse. Day 3: Matthew 21:1-11. Donkey or palm leaf – Playmobil pot plant pieces. Day 4: Matthew 26:26-29. Cup or bread – a Playmobil wine glass and a piece of bread. Day 5: Luke 22:39-46, 54a. Praying hands or pipecleaner man – I stuck together some pink foam which I cut into the shape of praying hands. A little lurid in colour. Day 6: John 19:1-7. Purple cloth. Well the cloth is maroon, but it was the best I could find. Day 7: John 19:16-17. Cross. I made this by snipping off the bottom of one of the kids’ palm crosses and sticking it together. Shhhh – don’t tell them. Day 8: John 19:18. Nails. Sourced from the Vicar’s tool cupboard. Day 9: John 19:33-35. Toothpick (for the spear). Actually I used half a cocktail stick (no toothpicks in the Vicarage), covered in silver foil. Day 10: Matthew 27: 57-60. Rock. Some gravel from the drive. Washed. Day 11: Mark 16:1-3. Cinnamon/cloves/spices. Had plenty of these in the cupboard. Day 12: John 20:1-8. And nothing in the egg! This was easy. If you’re really keen, Meredith commented last year with fifteen readings from Mark or even a series of 21 readings which you could use instead. And a Twitter friend mentioned that she’s adapted the idea for her Sunday school class. I’m hoping to extract some details from her later! On Wednesday, when we had an enforced day of holiday because of the public sector strike, Wonderfriend came round to play with the Queen. I was able to keep the two big girls and both my small boys occupied for a good part of the morning using a great present sent by Auntie Icklesis. I had to draw the figures but they did all the colouring. 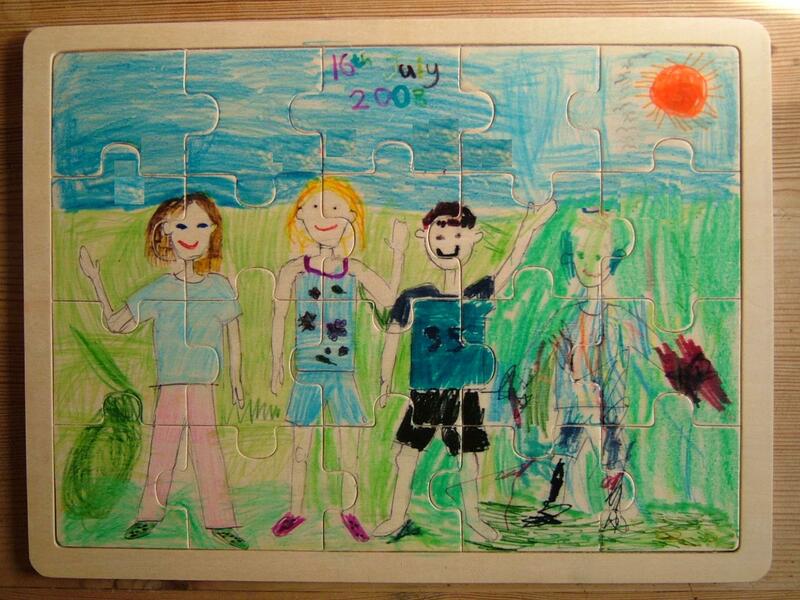 So many thanks to Auntie I and to the inventors of Paint a Puzzle. Now we only have to do something similar on the other side!